My latest interview is with R.G. Gallardo of Los Angeles. He's the author of "Survivors" and "Survivors Part II: After the Pandemic." Maria- Tell us a little about yourself and your writing journey. R.G.-My name is Raymond Gilbert Gallardo or R.G. Gallardo, born and raised in the Philippines, a former social worker, working with teenagers and their families in Southern California and Southwest Iowa for ten years. I went to Malate Catholic School from Grade School to High School and graduated from Letran College with a Bachelor of Science in Psychology in Manila, Philippines. My experiences with teens and their families helped me write my characters with in-depth and multi-layered personality and emotions. I’ve been a member of the Board of Trustees of the Sidney Public Library in Sidney, Iowa, before moving to Los Angeles, California. I enjoy reading and analyzing international geopolitical articles and books, and an avid reader of military history publications. I am the blogger, photographer, and videographer behind RG Los Angeles Stories, a blog about independent local artists and events in LA. R.G.- I draw most of my inspirations from the current socio-political issues concerning the United States of America, in particular, the Mexican Immigration issues being debated today. R.G.- My works are of Young Adult Fiction. 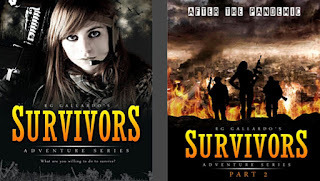 Maria- Tell me about your books “Survivors” series? R.G.- It is about Crisa McMiller, a strong-willed seventh grader, who, together with her family, mother, Joan McMiller-Agridor, wealthy Filipino stepfather, Daniel Agridor and sister, two year old Dani Agridor, escapes the deathtrap which is Los Angeles, California. The Mexican Flu, a highly infectious strain of H1N1 Virus that first appeared in Mexico City in September of 2012 is ravaging the United States and the rest of the world. The family escapes, race riots, genocide, militia roadblocks and biker gang attacks to Southwest Iowa to join the rest of the tough and colorful McMiller clan in a small town in Roughton, Iowa. While struggling to survive for two years, members of the household also experience love and passion while the family tries to overcome sporadic raider attacks and politically unseating the petty tyrant Mayor Himlar and his henchmen, Sheriff Jestafo and deputies, Moose and Lene from power. Maria- Where can your books be purchased and in what formats? R.G.- As of now, my works are available in ebook format in Amazon Kindle. Maria- What are you working on now? 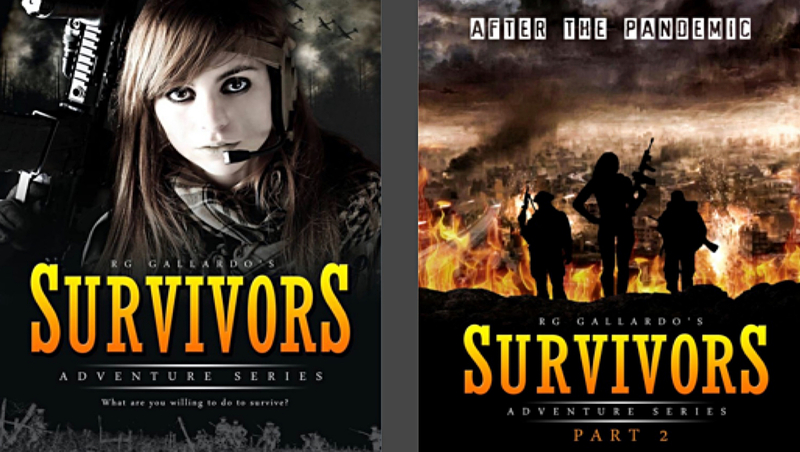 R.G.- My first and second book, "Survivors" and "Survivors Part II: After the Pandemic" are already available in Kindle and is gaining a lot of readers here in the United States and the United Kingdom. The Third book Survivors Part III: The New Threat will be available this November of 2015 and the target date for the fourth and final installment Survivors Part IV: The Rebel Offensive, is around the first quarter of 2016. Maria- How long did it take to write your first one? R.G.- It took me about one month to write the first one and another three to polish it. It’s important you have the same enthusiasm, if not greater, in editing your work. Maria- Do you have any tips for new writers? R.G.- I’ve learned this from other writers and I found it very valuable. It is important to write about what you know. The ideas and the narrative flow easily if you’re very familiar about your topic. Another essential thing is to work on your writing. The most relaxing and convenient way to learn how to write is to pick up a book. Read from successful works in your chosen genre; it will give you an idea on what kind of narrative works well with your target demographics. Maria- Do you have a favorite writing place? R.G.- For whatever reason, I found myself more productive in coffee shops. Maria- What’s your all time favorite movie? R.G.- Hands down, Children of Men by Alfonso Cuaron. Maria- I love sharing motivational or inspirational quotes with my readers, do you have one or two you would like to share? Maria- Who is your favorite author and why? R.G.- J.K. Rowling and her masterful Harry Potter books is my favorite author. She knew how to engage young adult readers, and I aspire to write my books’ plots the way she wrote hers. Maria- Describe to me your perfect day. R.G.- A perfect day for me is when I was able to have a cup of coffee and write—which I feel blessed to be able to do almost each day. Maria- Do you ever suffer from writer’s block? If so, what do you do to overcome it? R.G.- Fortunately, I have not experience it yet, because for me, even if I was able to write only a sentence in a day I consider it as productive. Maria- Is it frustrating to deal with the publishing industry? R.G.- This is a very good question, but one thing I learned is that there are vast amounts of resources within the social media network and one could really strike and be successful on his own. Importantly, I tend to spin any obstacles from cons to pros. I did get a lot of rejections but I came out from the experiences stronger. Most agents were gracious enough to even give me a tip or two so I still got something from them. And without the rejections, I would have not been able to meet my new friends and teammates who help me promote, edit, and design my books. Maria- Where do you see yourself in five years? R.G.-I see myself in different places here in the U.S. and abroad doing book tours. Thank you for reading and see below for his social links and his books on Amazon.